Beat Memories: The Photographs of Allen Ginsberg presents an in-depth look at the Beat Generation as seen through the lens of Allen Ginsberg (1926–1997). 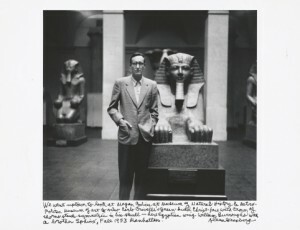 Although well known for his poetry, Ginsberg was also an avid photographer, capturing the people and places around him in spontaneous, often intimate snapshots. His black-and-white photographs include portraits of William S. Burroughs, Neal Cassady, Gregory Corso, Jack Kerouac, and others, along with self-portraits. Then skip your main course and go straight to what’s most important—dessert. Le Gigot offers some of the best sweets, especially their Le Gateau au Chocolat à la Crème Anglaise and La Banane Flambée au Cognac. Afterward, head over to ‘Ino, and take hold of something full-bodied and European. No no, I don’t mean that mysterious Parisian man behind the counter, I mean a nice chianti or merlot! And to finish off the evening, a delightful stroll in Washington Square Park.